If magnetism can be produced from electricity it was hypothesized by Faraday that electricity can be produced by magnetism. Faraday used an apparatus consisting of soft iron core similar to that shown below. The coil on the left was connected to a battery and the coil on the right was connected to a galvanometer. When the current flows through the left coil connected to the battery a magnetic field is produced. The strength of the magnetic field is increased by the iron core. Although Faraday was not able to produce a current in the left wire, but strangely he noticed that current was produced when the current changed. Faraday concluded that although a steady magnetic field produced no electric current, a change in magnetic field did produce a current. Such a current is called an induced current. The process by which a current is produced by changes in magnetic fields is called electromagnetic induction. A transformer is a device that increases or decreases voltage of alternating current. The current in one coil induces a current in another coil. A transformer consists of two coils (one coil is the primary coil the other is the secondary coil) wrapped around a metal core. (see images ---) When an alternating current passes through the primary coil and magnetic field in induced -- electromagnetic induction causes a current to flow in the secondary coil. If the number of loops of wire is the same in both coils the induced voltage will be the same in the secondary coil. If the number of loops in the secondary coil are greater than the primary coil the voltage will be greater in the secondary coil. This is an example of a step up transformer. How the number of loops affect voltage? If the number of loops in the secondary coil is more than the primary than the voltage will be more . The is called a step up transformer. Why transformers are important in transmission of electricity. Observe and identify the schematic and rating of the step down transformer to be installed. Remove the terminal connection box cover placed at the lower side of the transformer. Only the high amperage types will have this enclosure, while lower powered transformers will have an exposed screw terminal. Know termination identification follows for all step down transformers: H1, H2, H3 and H4 signify the high voltage side or power feed end of the transformer. This holds true regardless of the size of the transformer. Interconnection of the transformer will vary depending on the manufacturer and voltage used for feeding the transformer. Terminate the feed power wires first by cutting the wires to length. If you are using large wire lugs be sure to take into consideration the length of the lug and the amount of wire that can be inserted into the female crimp area. Strip back the outer insulating of the wires with the pocketknife or wire strippers. Insert the eye ring or wire lug over the bare copper wire and crimp the connection device, using the appropriate-size crimper, permanently to the wire. Terminate the high side, high voltage of the step down transformer. If the high side terminals are bolts, be sure to follow any torque requirements that are listed by the manufacturer. Terminate the low side, low voltage of the transformer. Note these terminals will be identified by X1, X2, X3 and X4. Again follow the manufacturer’s individual schematics for that particular type of transformer. Note that on small control transformers there will only be an X1 and X2. X1 is the power or “hot” side and X2 is generally the grounding and neutral portion of the low voltage. 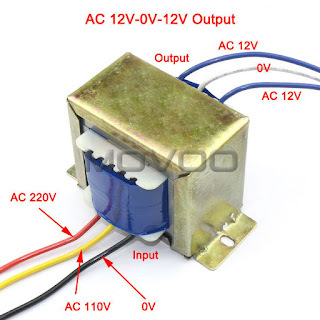 Terminate the small control transformer for X1 and X2. X1 will go directly to the control circuit after passing through a small fuse that is rated for the circuit. X2 will be terminated not only to the neutral side of the control circuit, but the grounding safety as well. In other words, the X2 side of the small control transformer must be tied to the grounding system of the electrical circuit. Replace all covers on the transformer and any enclosures that protect you from electricity. Apply the high voltage to the transformer by switching on the feeder power circuit. Turn on the low side safety circuit control. Use a volt meter to test for proper voltage on the step down side of the transformer. It should be the same that is listed on the specs tag provided by the manufacturer. Remove all wires from the transformer terminals using the screwdriver. Identify the wires if they are not already identified. Use a clear tape and pen. Write the terminal that the wires are attached to and place the identified tape on the wire’s end. Turn the volt ohmmeter to the “Ohms” position and place the red lead into the connector identified as “Ohms.” Touch the black lead to the metal frame of the transformer. Touch the red lead to the transformer’s terminals in the following order: H1, H2, X1 and then X2. The meter should read infinite ohms or wide open. Infinite ohms on a digital meter will be identified as a blank screen or a wide open will have the word “Open” displayed. If the meter registers any form of resistance, there is an internal problem with the windings. The copper coils may be shorted to the metal frame of the transformer. The transformer will have to be replaced. Check the continuity of each separate coil using the ohmmeter. Touch the black lead to H1 and the red lead to H2. The meter should give a resistance reading. Generally, it should read in the range of 3 to 100 ohms, depending on the style and type of transformer. Perform the same test to the X1 and X2 terminals. You should receive the same results. If the meter reads infinite ohms or a wide open when checking between the terminals of the same coil, the wires are broken. Replace the transformer. Use the ohmmeter to conduct the transformers isolation circuit. Touch the red lead to H1 and the black lead to X1. The meter should read infinite ohms or a wide-open circuit. Perform the same test, but to H2 and X2 respectively. If any resistance at all is read on the meter other than a wide-open circuit, the isolation of the transformer has been compromised and must be replaced.